World-class shopping centers displaying the latest products in fashion, textile, and electronics stand side-by-side with bustling traditional markets. 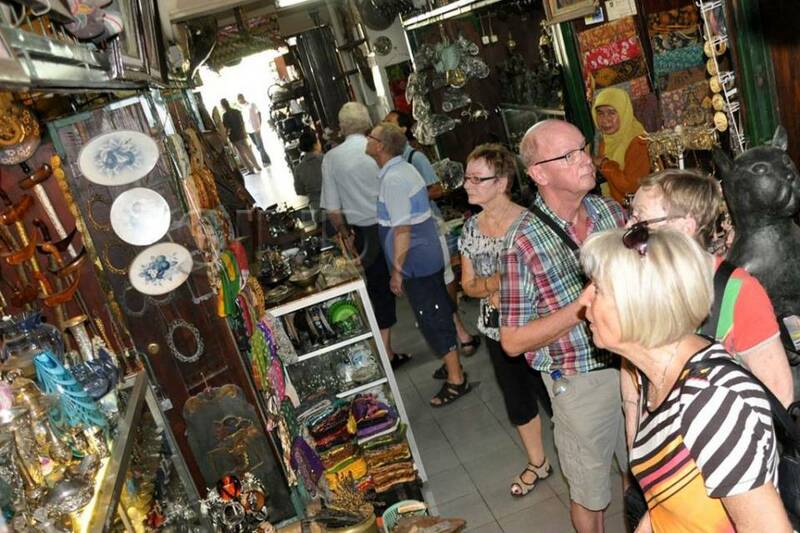 Here, browsing through numerous stalls that sell everything from spices and luscious tropical fruit to everyday household goods gives you the chance to mingle with the locals and soak in the atmosphere. It’s a unique and satisfying experience with the best bargains as the outcome. Marvelous shops, art galleries and boutiques offer exceptional value deals in ethnic items, traditional handicraft and modern artistic creations. Behind the smell, sights and sounds of a traditional market lay the fascinating secrets of the region. 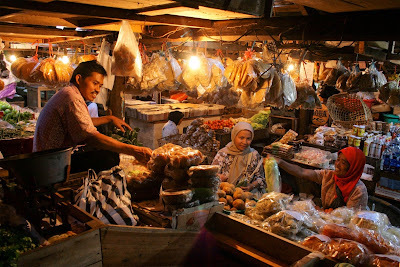 For most Indonesians living in urbans and rural areas, each day begin with a visit to the traditional market or pasar as these traditional groceries are usually foun near residental areas. Most traditional open-air markets are one-stop shopping affairs where haggling over a choice of fresh products, luscious tropical fruits, meat, fish, household goods, clothing and even stationery is the name of the game. 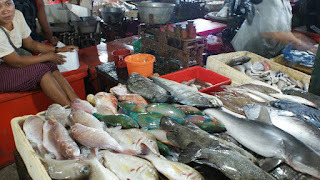 Some markets sell only spesific articles, like cakes and snacks, flowers, seafood, textiles, live animals, etc. Jatinegara is frequented by prospective couples. On the basement level shoppers can find various wedding souvenirs, wedding cards, and other paraphernalia to complete the big day. The price is of course much cheaper than you would find everywhere else. Shoppers can also ask for engraved souvenirs and it will take approximately two weeks to complete the order. Besides Tanah Abang, Pasar Baru and Pasar Mayestik are traditional markets that primarily sell textiles and fabrics, from brocades and silks to wool and cotton. The stores are mostly owned by Indian or Chinese merchants and open from 9 am to 9 pm. Another traditional garment center is the one located at Gang Tamim, Bandung West Java. "Gang" itself in Indonesian means a small pathway. This area used to be popular as the center of jeans fabric but nowadays almost every kind of garment product is available. Located on Jalan Tamim, Bandung, West Java, this garment center opens from 9 am to 5 pm. 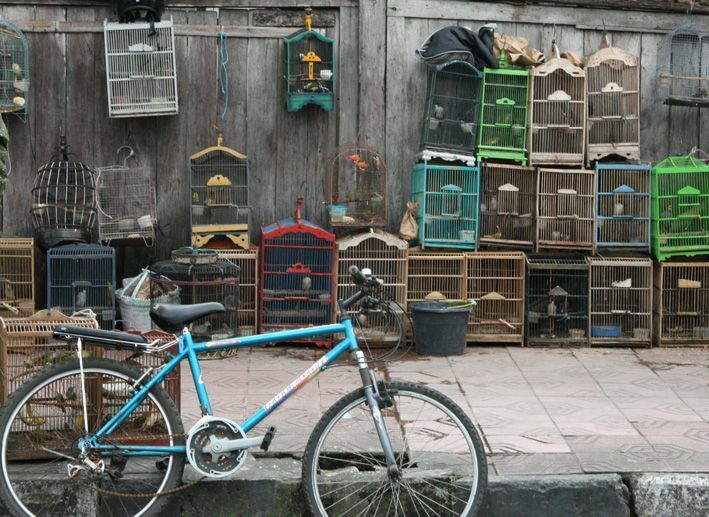 Indonesians, especially the Javanese love their birds, particularly those in cages. 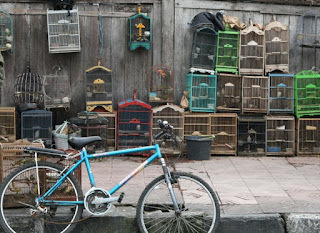 At Jakarta's Pramuka bird market visitors are greeted with a cacophony of singing birds, talking birds and pretty decorative birds. The oldest bird market in Yogyakarta is Pasar Ngasem, which is located only 400 meters from Yogyakarta royal court (Kraton) and where local species and foreign breeds vie for attention with their plumes and song. The most popular item in this market is the perkutut (turtledove/geopelia striata). Perkutut is highly appreciated by the Javanese and can fetch a price from thousands to millions rupiah. 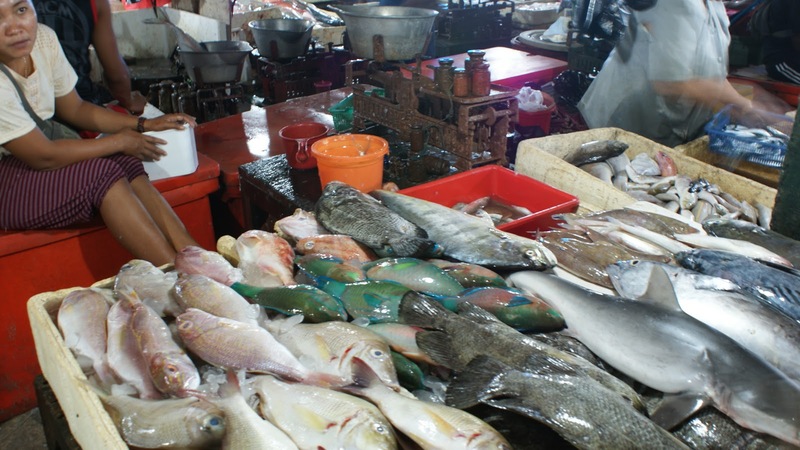 Brought in and auctioned at dawn, fish and other bounties of the sea are absolutely fresh at the Muara Karang fish market. Muara Karang turns to seafood center at night where smoke-filled seafood stalls tease the hungry crowd with mouth-watering grilled fish, spicy crabs, prawn and squid. Dawn till early morning is the time to snack on bite-size cakes and there are huge markets for them in Senen in Central Jakarta and Blok M in the south. From sweet Indonesian traditional creamy cakes to modern savory filled pastries, everywhere you see, trays and trays of luscious goodies are served to tempt your taste buds. Feeling rosy? Swing your steps to the sweet smelling Rawabelong flower market in West Jakarta that opens 24 hours a day. However, the hustle and bustle of the market usually starts after sundown. 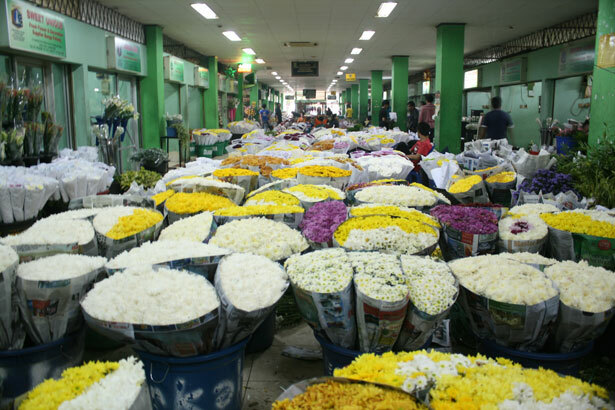 From tropical flowers to imported blooms, Rawabelong has it all, stems, bunches, corsages, you name it the flower sellers can have them ready for you. Interested in visiting Indonesia ? Visit Indonesia now ! 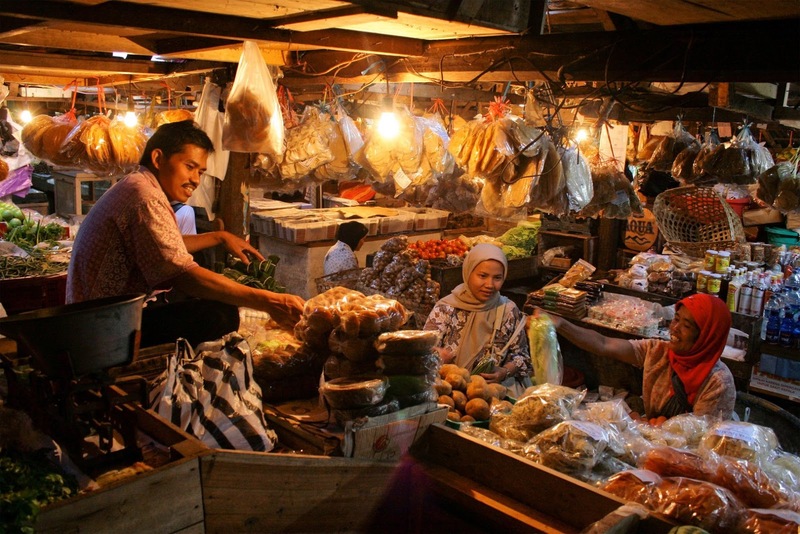 0 Response to "Traditional Markets in Indonesia"